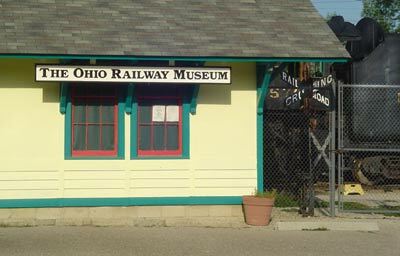 Started in 1948 the Ohio Railway Museum in now one of the oldest railway museums in America. 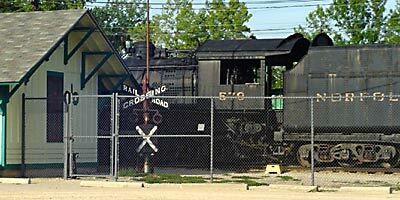 Located in Worthington just northwest of the capital city, the Museum sits along the current CSX rail lines. From the intersection of Interstate I-71 and State Route 161 the ORM is just one mile to the west then north on Proprietors Road. Open on Sundays from 1 - 6 pm you are offered a glimpse into a time and way of life long since passed. Upon entering the yard the massive Norfolk and Western #578 greets you. Built in 1910 it now rests here in its retirement. Along with the engine and coal tender it carries 3 Pullman classic passenger cars and one United States Postal car. While these historic units have not yet been refurbish each gives visitors a rare look at things as they were. From the brass ceiling fans and wall lights to the unique bathroom fixtures it takes little imagination to feel the motion and rhythm of these cars traversing the country. Every 30 minutes a ride for those wishing to experience the interurban transportation of the 1940's is offered. The electric trolley pulls away from the Worthington station and heads south toward Colonial Hills returning on the same track for a 2 miles round-trip. Once again the transportation is furnished but it is your imagination that will give you ponder to the times these cars connected small towns and cities alike. The Museum offers other views of interurban and streetcars from 1890-1906. Within the depot you will find a collection of photos and historic items pertaining to just a fraction of the rich history of trains in Ohio. Built in 1910 by the Richmond Works of the American Locomotive Company the 578 could pull 8 Pullmans at speeds up to 70 MPH. Assigned to the Scioto Division and operated out of Columbus from 1917 to 1944. This locomotive was retired from service in December 1958 and donated to the Ohio Railway Museum. Rides are offered every hour, starting at 12:30pm.